These can NOT be resold on Amazon.com!!! Buy fake snow online in different sizes including this great deal of 100 Mini packets, each makes approx 1 Quart of snow in a few seconds. Great for Party Favors, Company Gifts, Children's Holiday events. Pair this with our wholesale artificial snow party pack for the snow party of the century! 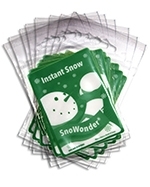 Buying SnoWonder instant snow is fun and easy thanks to our Wholesale Prices and Free Shipping! Buy instant snow powder here since these sell in stores for $2.95 to $4.95 each. Check out our Artificial Snow In Bulk here for a cost effective way to get a large quantity of snow. With instant fake snow you can let your creativity and imagination run wild as the possibilities are endless. If the theme of your event includes winter, snow, Christmas, skiing or snowboarding, or anything where dramatic white snow can play a part, Snowonder instant snow is what you need for a memorable presentation. Originally developed for indoor snowboard parks in Japan, Snowonder lets you create your own perfect Winter Wonderland event. SnoWonder is an extremely realistic artificial snow that can be used for parties, displays, holidays, hobbies, and all kinds of fun! SnoWonder fake snow powder is safe and non-toxic polymer developed specifically to imitate most of the properties of snow. It will not melt or blow away, and with a little care it can be used on almost any surface, indoors or outdoors (see Mixing instructions for outdoor use limitations). Our small instant snow packets make anywhere from a bowl of snow to a cubic foot of snow, and bulk quantities of every size are available. Indoors, SnoWonder instant snow lasts for weeks and can be reused to make it snow again and again!